K750 when applied will not show evidence of edge bleed, or bleed through even on the highest solvent content paint inclusive of enamels, two pack varieties and Gel Coats. 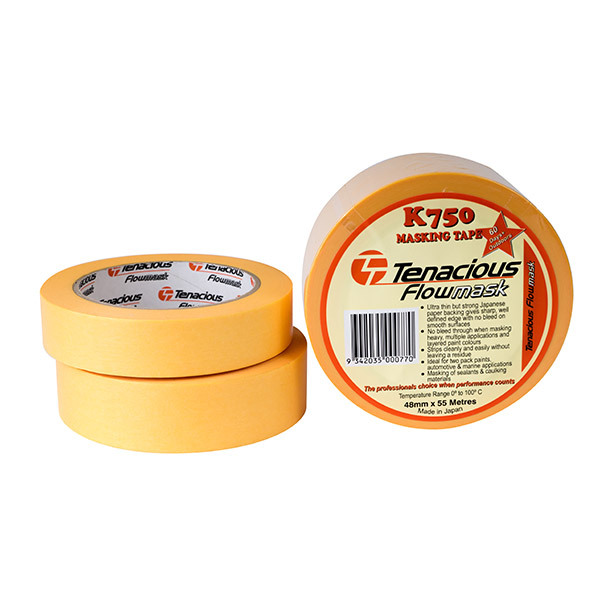 K750 Masking Tape - A very high specification masking tape manufactured in Japan that will 'clean release' i.e. leave no residue behind for over 60 days outdoors and over 120 days when used indoors. K750 uses a 'rice paper' backing as opposed to a traditional 'crepe paper'. The rice paper has a much higher tensile strength whilst being significantly thinner and thus provides a much lower profile of paint build-up on an edge line. The 'rice paper' is translucent and on most surfaces it is quite clear to see where it has been applied across the whole tape surface and where perhaps a spot has not made complete contact. This property is also useful when masking for stencil and air brush work as you can see pencil lines on the masking surface through the tape. This product has a unique adhesive system, such that you can touch adhesive to adhesive and pull tape apart cleanly with no damage to either adhesive surface.